Being a credible Jewish deli doesn’t mean having a signed headshot of Larry King on your wall -- it means being serious about the noshables, like this house-cured corned beef, which's brined for 10 days, steamed, and stuffed by the half-pound in each rye sandwich. 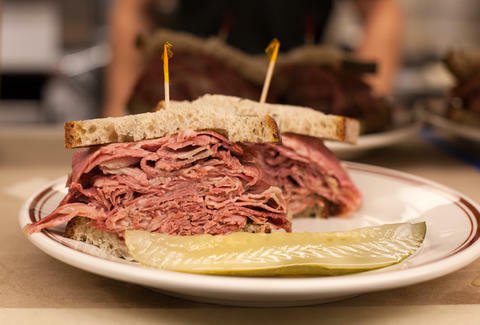 That’s just what Brendan Sodikoff (Au Cheval, Gilt Bar, Bavette’s) has in this Old World deli packed with Jewish favorites like smoked pastrami, knishes, tongue Reubens, and a potato chip Caesar salad that may have you loosening your borscht belt. The dim, throwback aesthetic will feel familiar to anyone who's dined in Dillman's sibling establishments. 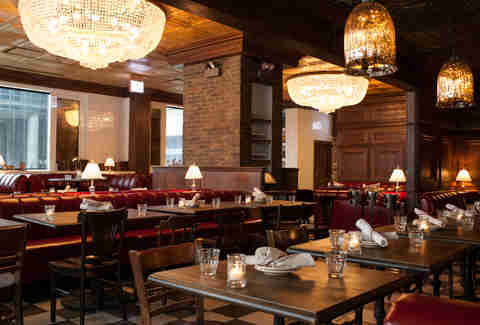 The space is divided into a coffee bar and bakery offering communal seating as well as fresh bagels, a cocktail bar where you can put back a Negroni or Saratoga, and a dining room with cushy booth seating, chandeliers, and a fireplace (bearskin-lounging Burt Reynolds not included). 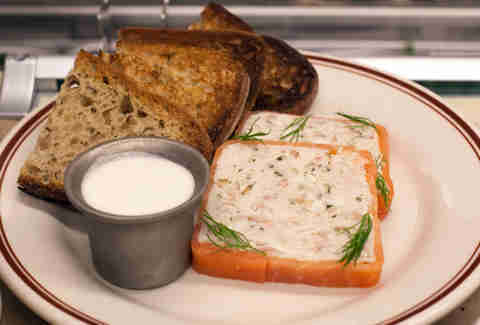 The lox and whitefish terrine has smoked whitefish folded with dill, pepper, and cream cheese, and's wrapped in smoked salmon (fish wrapped in fish like a fish Inception, or “Fishception”), served with house-made toast and horseradish sauce. Other terrine action includes duck & goat cheese or smoked foie gras. This smoked mozzarella sandwich with avocado, tomato, sprouts, lettuce, and dijonnaise joins the sandwich lineup along with a Russian-style tongue Reuben and a fried beef bologna that’s made the jump from Au Cheval’s menu. Not making the jump after eating it: you. 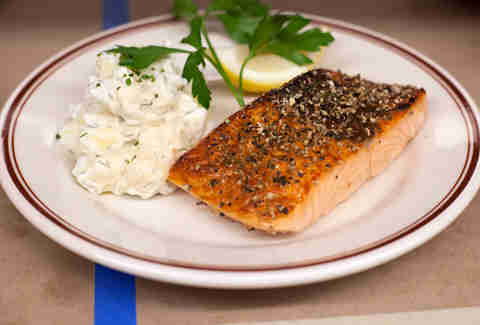 For entrees, there’s roast beef French dip, chicken pot pie, and this broiled lemon-pepper salmon with dill potato salad. 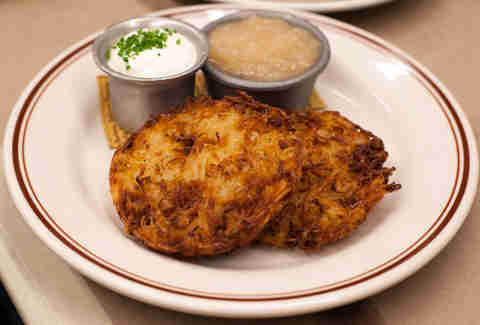 If you’re not done knishing and knoshing, the latkes combine shredded potatoes & sauteed onions and're served with apple sauce and sour cream. It’s enough to make you swoon like Larry King shopping for suspenders.